Editor’s Note: Tammy Wolf is the first and only Canadian to compete at the world-famous 24 Heures de Rouen(24 Hours of Rouen) powerboat races in France, where her all-female team finished 4th in Formula 2. But long before Tammy was making waves competing in Formula 2 racing, she was learning the ropes across Ontario. And what a place to learn—Ontario boasts some 400,000 lakes, rivers and streams that comprise an estimated 15% of the world’s freshwater, making it an exceptional place to hit the water. In 2013, Tammy’s team is proud to represent Mercury – Canada, a world leader in the marine industry. 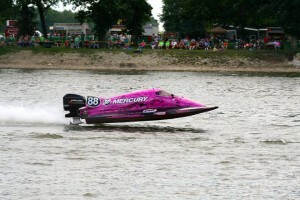 Thanks to their help, the team will compete in Formula 2 with a Mercury OptiMax 200 XS SST engine. Here, she shares her thoughts about growing up in Ontario, and the critical role that it played in her current success.